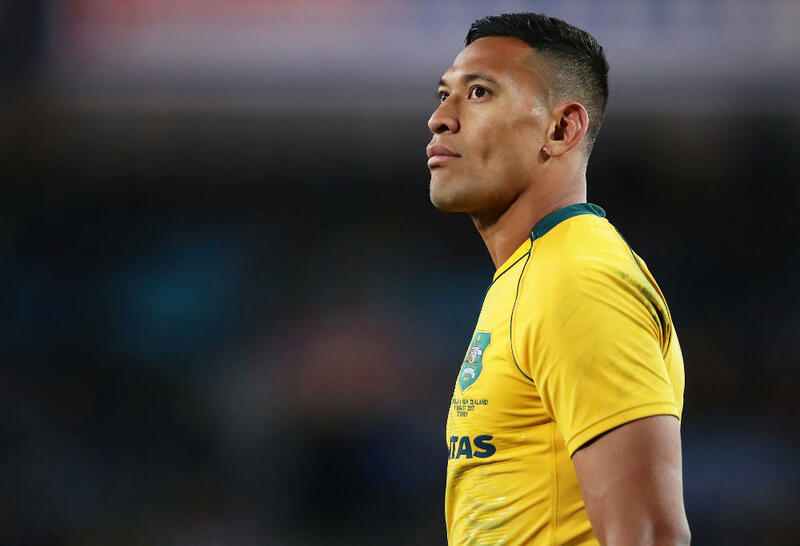 Last week, the Sydney Morning Herald published a letter that made a snide personal attack on Israel Folau by linking his off-field comments with his on-field play. “There’s something delightfully karmic about Israel Folau being judged unfairly”. It’s time for the SMH to stop painting Folau as some sort of community scourge. 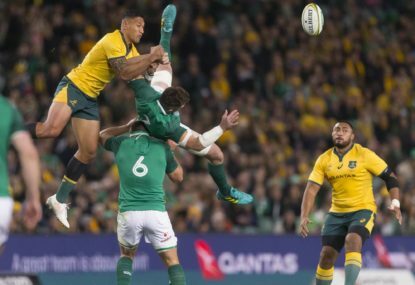 And, moreover, it is time for the publication and the Australian rugby community to stop its outrage over World Rugby’s week-long suspension of Folau for his dangerous contact in the air with Ireland’s Peter O’Mahony during the third Test of the enthralling series against Ireland. Over the weekend, the Waratahs survived the loss of Folau (and Michael Hooper, with his hamstring problem) by defeating the Rebels 31-26 at Melbourne in one of the best Australian derbies in many years. But after the match, the Waratahs coach Daryl Gibson returned to the Folau issue, rather like a tongue seeking out an aching tooth, by asking World Rugby to provide some clarity on challenges in the air. You expect the Fox Sports claque of commentators to be “Aussie! Aussie! Aussie!” in their attitude to anything that happens on the rugby field, even when they often have to display an invincible ignorance of the complex laws of the game to maintain their ridiculous displays of rugby ockerism. But the coach of the Waratahs, the coach of Israel Folau, must meet a higher standard of commentary. The fact of the matter is that Ireland exposed a weakness in Folau’s high ball technique that needs to be fixed up. The person who should help to fix the problem is Gibson, in his capacity as coach of the Waratahs. But if he is unwilling to work out what World Rugby finds illegal, in a rugby sense, with Folau’s high ball technique, then the Waratahs and Wallabies star is going to receive a lot more yellow cards in the coming Super Rugby finals and the Tests leading up to and through the Rugby World Cup in Japan next year. Israel Folau’s technique is fine when he is catching the ball. He turns his back in the textbook manner as he makes the catch, with two hands. This last phrase, “with two hands,” is the crucial point. There is no way with this catching technique, allied to his leaping skills, for him to pull on the limbs or jersey of someone contesting the catch against him. Maria Folau, Israel’s wife, posted a tweet and a picture of her partner taking a high kick-off in the opening minute of the Brisbane Test during which shows clearly that Ireland’s Rob Kearney has hands around his (Folau’s) waist while the catch is being made. Well, no. It was not reckless and it did not result in any injury to Folau. Folau actually jumped into Kearney before the Ireland player could make his leap. This is quite clear from the photo that headed the Twitter comment. Israel Folau’s problems really relate to when he is the chaser rather than the receiver of a kick, either in general play or from kick-offs. And specifically with a cunning legal tactic devised by the Ireland coaching staff to counter Folau’s spectacular aerial skills. When he is chasing down a high ball, Folau likes to time his jump so that he comes in sideways, with his back turned on the receiver standing under the ball. After being terrorised by Folau in the first Test, Ireland created a plan where runners came back in a line outside of the catcher. Folau was forced to come around these runners, somewhat like a high jumper with an angled run-in to the bar. He also had to leap extremely high as Ireland decided to lift the catcher. When Folau missed the catch his hands almost instinctively locked on to the arms of lifted catcher. This happened twice in the third Test. The photos of two incidents in this Test, where Folau was “reckless” according to World Rugby, show him well behind the lifted catcher and, therefore, in a position where it is almost inevitable that he will topple the lifted catcher dangerously to the ground. Most international teams will now defend their catchers against Folau in the Irish manner. If Folau does not adjust, he will be carded out of Test rugby. This is why the Waratahs coach needs to adjust Folau’s technique with his time headed for the Super Rugby finals. My worry about this need for Folau to correct his fault in technique is that I say that there is no one in the Australian rugby community in an official position or in the media (with the exception of Paul Cully) who seems to understand the hard fact that there is a weakness in Folau’s technique and that the weakness needs to be corrected. I say with all honesty that the greatest impediment to the successful progress of Australian rugby teams, at all levels of the game, is the total unwillingness to accept that the overall poor record is due to coaching and playing weaknesses and not perceived poor decisions by referees and TMOs. In the Folau case, the Australia rugby leadership group, officials, coaches, players and media (the claque, as I perceive it) have been obsessed with raising a phony defence that the Folau problem is related to a failure of the lifter to bring his catcher safely to the ground. They then argue that lifting in general play should be banned. It is true that lifters are required to bring the lifted player safely to ground. It is one of the more arcane laws of rugby. I have never seen it applied (as it should be) on the rare occasions, generally from kick-offs, when the lifted player has toppled to the ground when the positioning for a catch has been misjudged. But this requirement of bringing the catcher safely to the ground does not apply if an opponent interferes with the catcher in the air and effectively topples him. We see this requirement come into play frequently in lineouts when a lifted jumper is interfered with and crashes to the ground. Invariably, and correctly, a penalty or sometimes a card, is awarded against the player who interfered with the lifted jumper. Paul Cully, in an informative article in the SMH headed ‘Wallabies and World Rugby at war after ruling grounds Izzy‘, points out that World Rugby made a “strong defence” of the single lifter technique in its ruling on the Folau-Peter O’Mahony incident. The point that World Rugby is making here is that receiving teams need to have a remedy to balance charging runner/jumpers when a high ball is directed at them. That remedy is the single lifter technique. It seems to me, from an extensive reading of the history relating to the laws of rugby, that this direction follows the historical trajectory of the game as it evolves out of a “rugby football” code that rewarded kicking skills in the main into a specifically “rugby” code where the rewards mainly go to the teams with running and passing skills. Remember, the myth of William Webb Ellis is that he picked up the ball and ran with it on the Big Field at Rugby School. Before you could kick a goal in those early days, you had to score a try. The true DNA of rugby, therefore, lies with those aspects of the game that do not involve kicking. And wonder of wonder, the Waratahs and the Rebels, playing a running and passing game with high skill levels, put on a tremendous match at Melbourne. The Waratahs look certain to be the top Australian team in the finals. The Rebels should join them in the finals, as one of the bottom qualifying teams. The Brumbies, playing with the brutal efficiency that was once their hallmark, reduced the Hurricanes to error-prone wrecks in their emphatic 24-12 victory at Canberra. I can’t see the Brumbies making the finals, although I suppose there is an outside mathematical chance of this happening. So my fearless prediction is that the Waratahs and Rebels will be finalists, along with the top four New Zealand teams (no Blues, in other words) and the Jaguares and Lions from the South African Conference. The Rebels should get to 39 points, the bottom line for qualifying teams I would guess, by defeating the Reds at Suncorp Stadium, Brisbane, next Friday night. The Waratahs should also get into the safe 40+ points zone when they defeat the Sunwolves at Allianz Stadium, Sydney, even though the Sunwolves were impressive in defeating the Bulls in Singapore over the weekend. It seems impossible, though, for the Brumbies to get the ten points they need to be in with a chance for the finals from playing the Chiefs at Hamilton and then the Waratahs at Sydney. The dark horse in the finals are the Jaguares, who are on a terrific winning streak that should see them defeat the Bulls in Pretoria and the Sharks in Durban. If the Jaguares get a home final as the winners of the South African conference, the team that plays them is, to put it mildly, going to be for a torrid time.